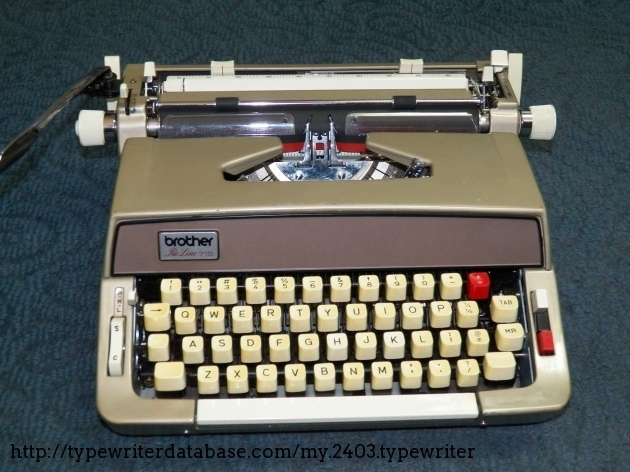 Mark Rosenzweig 1969 Brother Pro-Line 715 Serial # G9462174 1969 Brother Pro-Line 715 typewriter, Serial # G9462174 Mark Rosenzweig's 1969 Brother Pro-Line 715 typewriter. 2014-04-12 2014-04-12 From the Virtual Typewriter Collection of Mark Rosenzweig: 1969 Brother Pro-Line 715 Serial # G9462174 This large Brother portable has features that other Brother machines lack, such as ribbon selection via push buttons, a paper insertion lever, and the ability to take a "dial-a-type" element, as indicated by the red key top for + =. This machine has such a dial-a-type element, which you can see as the cylindrical element on the type bar farthest to the right (the + = type bar) and for which I've provided a separate photo. This element provides six pairs of characters, which are selected by rotating the element. On this element, the element has accents, an upside down exclamation point and question mark for Spanish, a British pound currency symbol as well as + =. This large Brother portable has features that other Brother machines lack, such as ribbon selection via push buttons, a paper insertion lever, and the ability to take a "dial-a-type" element, as indicated by the red key top for + =. This machine has such a dial-a-type element, which you can see as the cylindrical element on the type bar farthest to the right (the + = type bar) and for which I've provided a separate photo. This element provides six pairs of characters, which are selected by rotating the element. On this element, the element has accents, an upside down exclamation point and question mark for Spanish, a British pound currency symbol as well as + =. Unique "dial-a-type" element goes on + = type bar. Rotating it allows selection of six pairs of characters. 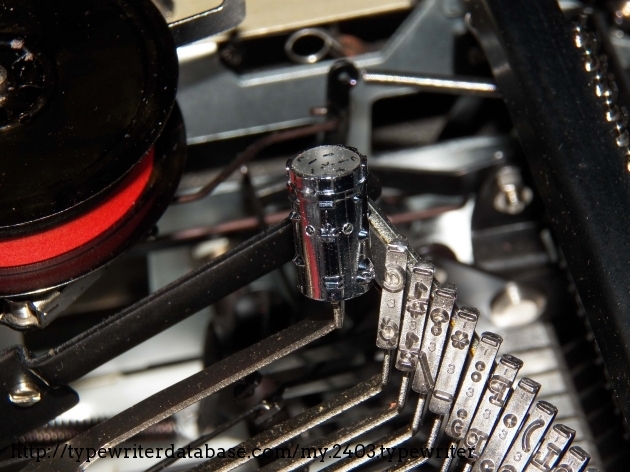 I have collected typewriters since the early 1970s. 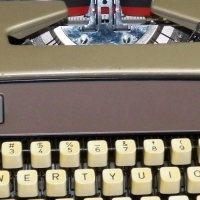 My first collectible machine was a Mignon, but I also had everyday typers then, first a Voss ST-24 and an Olivetti Praxis 48, and then a Hermes 3000 and a Hermes 10. Over the last decade or so, I've turned my focus from early machines (Lambert, Blickensderfer, Hammond, Smith-Premier, etc.) to portables. Besides typewriters, I also am avid about Studebakers, and have had a 1964 Studebaker GT Hawk since 1979. RESEARCH NOTE: When researching the Brother Pro-Line 715 on a computer with lots of screen real estate, you may find that launching the Brother Serial Number page and the Brother Pro-Line 715 By Model/Year/Serial page in new browser windows can give you interesting perspectives on changes throughout the model series.